Serendipitous Stitching: Becoming a OAAT Stitcher! Sort of anyway if you don't count the Ten-a-Day, the Temperature SAL and the Bath Time stitching! The Focus on a Finish project is currently Just Nan's 12 Days of Christmas. I had been doing one a month throughout the year and have just two left to complete in November and December. It made sense to work on both together to save changing colours so much. 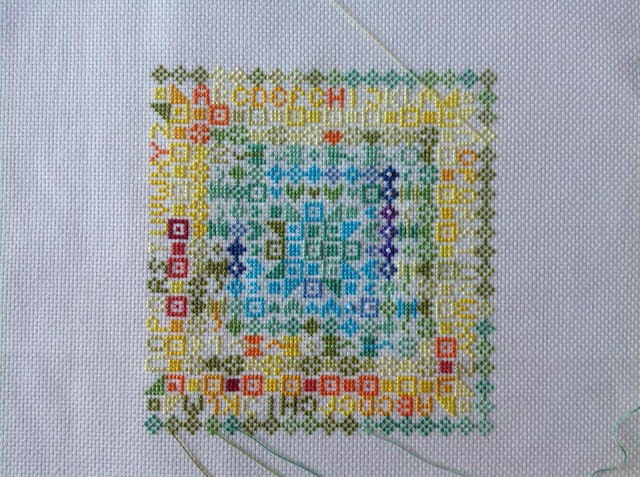 Getting close to a finish, just some black, some gold, the numbers and some backstitch. Easily finished in time for Christmas this year. One more column on the left and then the final four days of December have an entire side each. Hetti has suggested that we had the words Temperature SAL and our location in the top and bottom borders which is a great idea. 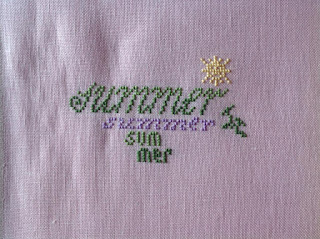 It's really nice to be stitching something Summery even though I had to double check that was a yellow sun and not a white snowflake! My rock painting has turned to Winter though. Our group is hosting an Advent Calendar. The chief Admin came up with 25 themes and we add a rock each day. 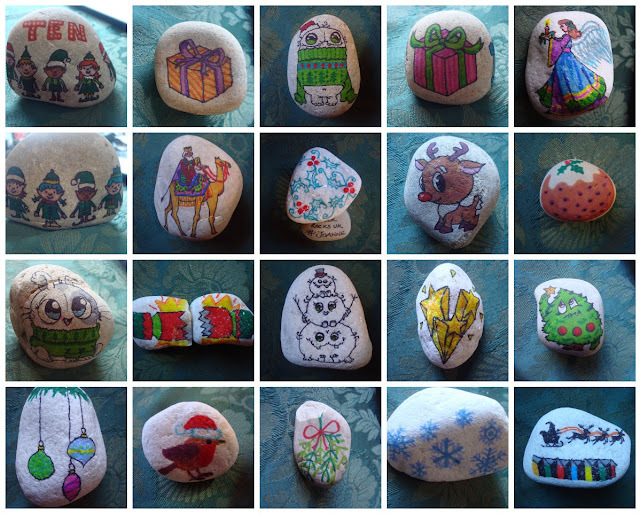 Here's a random selection of Christmas rocks I have done (not in any order, just added randomly). Some will be hidden in the shop, some are off to Dover with a friend and some will be hidden near the local Primary School. Too cold and muddy for the woods right now! Thank you for organizing another fun activity for us. It has been interesting to hear favorite carols from others. Your rocks are stunning Jo. I love everyone of them. Awesome progress on your projects. I love your temperature stitch a long! Sarah at http://sarahdidit.blogspot.com hosts a weely link up on Wednesdays for Temperature projects. I'm working on a hexie quilt. Want to join the link up? You are such a talented painter--along with all your other talents of course. And OAAT stitching is definitely appropriate in certain situations. Your 12 Days is going to be so pretty. I have been enjoying the Advent Blog Hop! Oh, Jo! Lovely stitching on your OAAT project, and your painted rocks are gorgeous! Love the temperature piece too ..... well done for keeping it going! 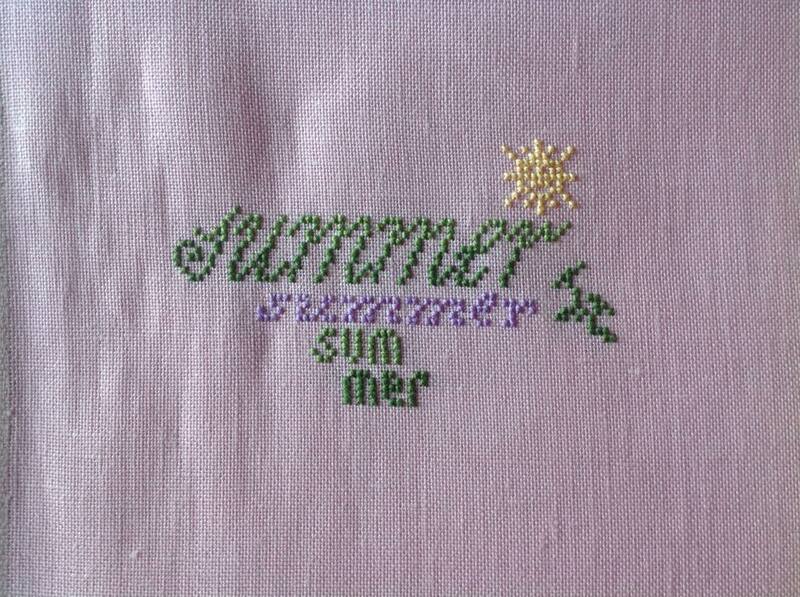 Summer typography is great too! I’ve fallen behind on the Advent hop in trying to listen to all the lovely music. Hope no one chooses my choice just before my day, Tee hee! Thanks for organising us all again! Lovely post again with lots of Stitching goodies . I like your pretty temperature piece and the rock painting, great work. Beautiful work! The Temp SAL has turned out so pretty! I love the color palette that has come about with it. I can't wait to see your finish of the 12 Days by Just Nan! It is a really cute pattern! And oh my, your rocks are amazing! Such variety and detail! Have a great day, Jo! Beautiful stitching. Great work on everything. I just LOVE your rocks. You rock haha get it haha. Yeah it was lame. Great work on the Temperature SAL, Jo, mine is languishing somewhere but I am sure will turn up when we finally move. Love the rocks and the Just Nan is looking great! Hung up my 12 Days at the weekend when the tree and decs went up, thought of you as I unpacked it and put it up. I was wondering if yours was almost finished. Super stones, love them all. What fun rocks you have painted, Jo! I am in awe as I can't draw at all--not even a stick figure :) I know that is why I like stitching as it makes me "feel" like I'm artistic! I was so pleased to come across your blog today. Such lovely work! Your Focus for a Finish is progressing nicely :) I'm looking forward to seeing what else you'll be able to finish this year! And thanks for just reminding me; I wanted to try that temperature SAL next year...time to pick out some colours! You, a OaaT stitcher? Next pigs will be flying and hell hath frozen itself over. Your pebbles look great again. Is the one with your hashtag one piece shaped like a mushroom? Or are they conveniently stacked?